Biopolymers and biodegradable plastics are finding new applications in various sectors, from packaging, to medical, automotive and many more. As synthetic plastics are increasingly replaced by their bioplastic equivalents, engineers are facing new challenges including processing, costs, environmental sustainability and – ultimately – developing successful products. Biopolymers: Processing and Products, the second book of a trilogy dedicated to biopolymers, gives a detailed insight into all aspects of processing, seamlessly linking the science of biopolymers to the latest trends in the development of new products. 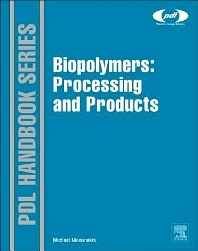 Processes covered in the book include blending, compounding, treatment, and shaping, as well as the formation of biocomposites. Biopolymer coatings and adhesives are also investigated. This book unique in its coverage contains information retrieved mainly from patents, which form the bulk of the book. The coverage of processing will help engineers and designers to improve output and efficiency of every stage of the product development process, and will form an indispensable tool in selecting the right biopolymer and processing technique for any given application, covering medical, automotive, food packaging and more. It will assist also engineers, material scientists and researchers to improve existing biopolymer processes and deliver better products at lower cost.